As the final exam for the Women in Cities class in the SUMA program, students were asked to submit a 1,500-word blog post, sharing their own observations about women’s lives in urban contexts and [their] thoughts about what might be done, if anything, from a design, engineering, public policy and/or management point of view, to enable them to be full participants in the life of the city. Students were encouraged to think critically, boldly, and to focus on one or more cities, firms or specific issues facing urban women and girls, using concrete examples and incorporating ideas and solutions from the term’s readings, lectures, and guest presentations. The following post is Brianna Moland’s final project for Professor Susan Blaustein’s course, Women in Cities in the SUMA program. Brianna gives an introduction to some of the reasons why the impacts of climate change can be especially difficult for women to overcome. 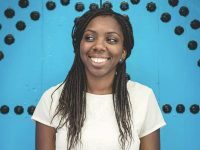 She understands that there is plenty of work to be done on gender equality and climate change, and this is why she chose to focus on climate change and developing countries in her own academic and professional career. Imagine being forced from your home because the wet season’s rains never came. The crops you grow and sell with your husband and your children did not receive badly needed irrigation, so you had nothing to sell at the market. Situations such as this are occurring more frequently in agriculturally-based communities around the world. 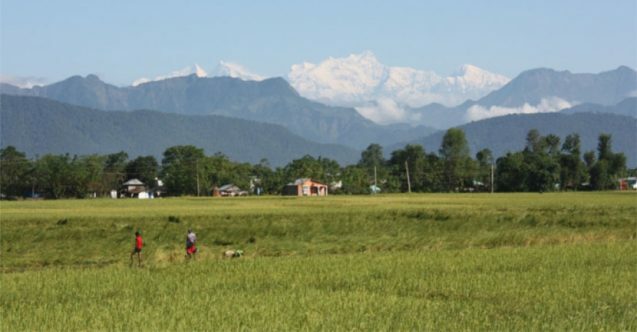 In Chitwan Valley in Nepal, desertification is decreasing the amount of timber that women in local Nepalese communities use to create profitable goods (Hunter 2012, pp. 1-2). Instead of staying in their environmentally degraded homelands, these women are heading to urban areas for the promise of higher pay in the city. Moreover, it is widely believed that forced migration due to climate and environmental changes will continue in the future. Climate change has been called a social, economic, and political phenomenon with profound implications for social justice and gender equality (GenderCC 2017). Rising seas, unpredictable rainfall, and more intense storm surges are drastically impacting vulnerable communities such as the network of women from Chitwan Valley in Nepal. Women are considered a vulnerable group because of their perceived unequal status in society when compared to men. Some women, especially those in developing countries, lack land ownership rights, equal access to basic public services such as sanitation, as well as security and safety in public spaces (UN-Habitat 2013, pp. vii). By examining work from Lori M. Hunter (2012), Dr. Mindy Fullilove (2001, p. 76), and Despina Stratigakos (2008, p. 9) we see that women and girls who move to urban environments fleeing environmental degradation sometimes face worse odds than they would by staying in their ancestral homes. It is more than just environmental factors that cause climate change-induced disasters like desertification and famine, which heavily impact women. Limited urban planning and design, inadequate land management, poor physical and social infrastructure, and the lack of equitable distribution of resources and policies are some of the reasons why disasters are riskier for women than for men (UN-Habitat 2013, pp. vii). These disparities stem from gender inequality and the undervaluation of women’s reproductive and productive efforts. Throughout the centuries, social inequality between women and men has been persistent and pervasive. In “A Women’s Berlin: Building the Modern City,” Stratigakos highlights that even in the heart of Europe, unmarried women were historically seen as “unproductive members of society” before the 1900s (Stratigakos 2008, pp. 12). “Women’s work” was and still is culturally devalued. There has been little recognition of women’s reproductive work and the work that women conduct in the informal sector. Even with “productive work,” women are generally paid less than men. This could be because women need to work part-time more often to take care of their children or other family members since they are usually caregivers, providers, and child-bearers. They often have more responsibilities but fewer rights than their male counterparts. As Jeff Crisp of the UN Refugee Agency has explained (Brown 2007, p. 8), women “who are displaced from or who feel obliged to leave their usual place of residence, because their livelihoods and welfare have been placed at serious risk because of adverse environmental, ecological or climatic processes and events,” are known as “forced migrants.” What happens to the women who are forced out of their homes because of unlivable conditions where they originally resided? Fullilove’s work explains that some of these women can undergo “root shock,” or the traumatic response and reaction to being forced out of their home environment. The absence of their support system of friends, neighbors, and extended family members could mean that no one is able to watch their children while they are working or take care of them, should they fall ill in their new location. In a study conducted in the aftermath of Hurricane Katrina, single mothers of African American descent were the most psychologically scarred from the inability to return to their homes after the storm surge and subsequent flood (Schumaker 2015). They had to leave behind their extended family members, what was left of their homes, and their social support systems. The study found that chronic stress from continual displacement is linked to depression, anxiety, and sleep impairment (Schumaker 2015). Feeling unwelcome in their new surroundings caused undue emotional stress. The UN Refugee Agency states that competition over resources and jobs can generate animosity between forced migrants and host communities, adding an additional layer of complexity (UN Refugee Agency 2015, p. 6). Plus, there is the potential descent into homelessness, once women and their children arrive in unfamiliar cities with dwindling financial resources. The journey to reach their destination is usually costly. This means that forced migrants are arriving in cities with no money and no one to help them care for their children while they search for accommodation, a job, and food for their families. Forced migrations ultimately diminish social capital or the network of relationships among people who live and work in a particular society. University professors Deepa Joshi, Ben Fawcett and Fouzia Mannan explain that homeless women are especially vulnerable because they lack the financial means to “build an identity and access basic services” (Joshi et al. 2011, pp. 95-96). Women, girls, and young boys are also more vulnerable to sexual abuse and molestation when subjected to living on the street. Although the risk of sexual abuse is present in rural and urban settings, cities have more public spaces – e.g., public transportation stations, public sanitation facilities, and parks – that provide more places and opportunities for sexual predators to harass women and children (UN Women 2017). To combat some of the consequences of forced migration, all efforts should be made by non-governmental organizations (NGOs) and the host city to provide migrant women with safe and affordable housing options. Elizabeth Fussell, a population studies professor at Brown University, states that “housing is the key to recovery” after an environmental disaster. NGOs such as House of Ruth in Washington, D.C., initiated programs like New Pathways and Three Sisters to provide permanent and supportive housing to women, with no limit on the length of their stay. By creating a city where everyone feels at home, community cohesion can exist. Community solidarity helps during times of disaster because neighbors seek to protect each other, thereby ensuring that city women and members of their social networks are accounted for. To help women become full participants in the life of the city, it is necessary for them to have accessible housing. Climate change adaptation strategies such as ecosystem restoration could be an effective means of keeping women and their families safe in their original homes. With Hurricane Katrina, restoring the Louisiana wetlands and coastal marshes could have lessened the impact of the storm surge. Scientists estimate that approximately every three miles of healthy wetlands can trim one foot from a storm surge (National Wildlife Federation 2017). If critical Louisiana wetlands had been protected from development, this could have assuaged some of Katrina’s damage. Less water would have flooded fewer homes, and more families could have remained in their city. Effective climate change adaptation and disaster risk reduction can alleviate some of the existing economic and social vulnerabilities that come with climate-related displacement (Brown 2015, pp. 26 and 29). Resilience-building helps communities “bounce back” from disasters and become stronger than they were before the hazard occurred. While resilience lessens the need for women to relocate after an environmental disaster, there are instances where forced migration is unavoidable. With desertification in Nepal, some women have no other option but to leave. Fortunately, NGOs like the women-run organization Pourakhi, provide women in Kathmandu, Nepal with sustainable employment after they arrive in their new urban setting. The word “Pourakhi” means “self-reliant” in Nepali, and these women are indeed taking care of each other, through psychological counseling, emergency shelters for returnee migrant women workers, and medical and legal services. Maya Gurung, a Nepalese woman forced from her home in Chundevi, Nepal, was recently assisted by Pourakhi (UN Women 2012). She was provided with shelter and paralegal services, and now works in Pourakhi’s training center. Through the organization’s reintegration programs, 608 women have become entrepreneurs and now earn a medium income, by Nepalese standards. Creating cities where women can thrive means not only providing safe, accessible, and affordable housing, but also a place where women can “nest” (Robinson 2011, p. 18). This would be somewhere of their choosing where women feel comfortable enough to let their guard down, thrive in their new surroundings, and enjoy their lives. Disaster risk management and valuable work undertaken by NGOs to provide safe and affordable housing are helpful solutions. However, existing social inequalities between women and men are at the root of the issue and must be addressed, moving forward. Gender inequality undermines the full potential of women and girls living in patriarchal societies around the world. Although adaptation policies and the work of non-governmental organizations have made significant progress when it comes to reducing the impacts on women of climate-induced disasters, there is still more work to be done. It will take the cooperation of both men and women to move women and girls from the “vulnerable” category to that of being truly and sustainably empowered. 1. Brown, Oli. “Climate Change and Forced Migrations: Observations, Projections, and Implications.” Human Development Report Office, 2015, pp. 8, 26 & 29-30. 2. Fullilove, Mindy. “Root Shock: The Consequences of African American Dispossession.” Journal of Urban Health: Bulletin of the New York Academy of Medicine, vol. 78, no. 1, 2001, p. 76. Comments from Brianna: Some of the challenges of writing this piece were that the topic is multi-faceted and complex. 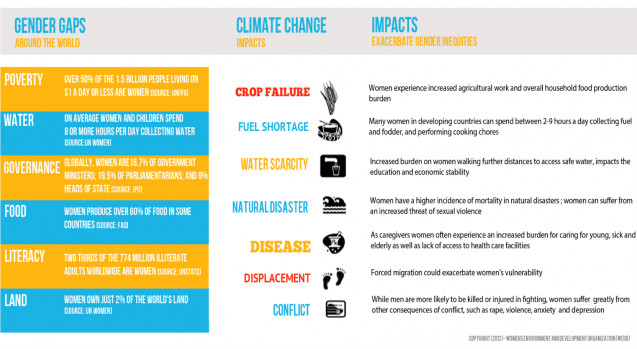 Although I could not cover everything that I learned from my “Women in Cities” course, I tried to give an introduction to some of the reasons why the impacts of climate change can be especially difficult for women to overcome. I encourage those who are interested to explore the links provided in the article and to contact Professor Susan Blaustein if they are interested in learning more. I know that there is plenty of work to be done on gender equality and climate change, and this is why I have chosen to focus on climate change and developing countries in my own academic and professional career. Brianna Moland graduated in May 2017 with a master’s degree from Columbia University in Climate and Society and has a B.S. in Conservation and Resource Studies from the University of California, Berkeley. 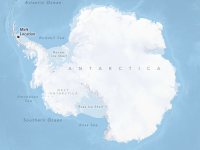 A staff writer for the nonprofit website GlacierHub, which educates the public about glaciers and the impacts of climate change, Brianna is interested in international climate change adaptation and sustainable development in developing countries. In her free time, she enjoys learning Brazilian Portuguese, trying new restaurants and exploring New York City. 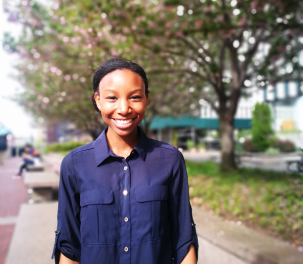 The flexibility of the Master of Science in Sustainability Management allows students like Brianna to cross-register from other schools and take SUMA courses, and SUMA students have the opportunity to take courses from other schools through Columbia.